Days of Our Lives Spoilers: A Slip of the Lip In Front of Tripp! 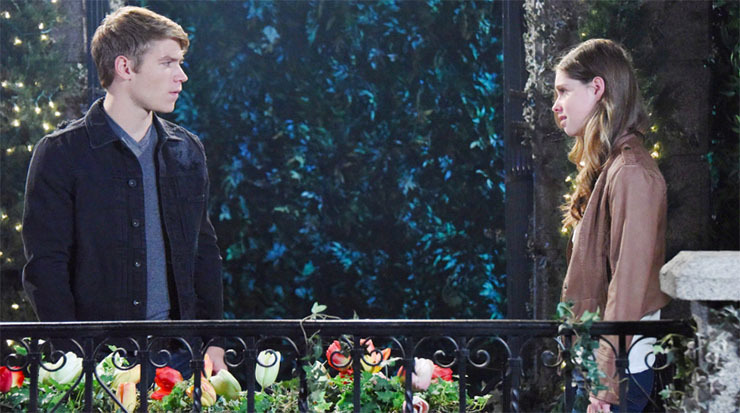 Days of Our Lives Spoilers, Friday, April 28th: A Slip of the Lip In Front of Tripp! Tripp is like, come again, Jade, in the Days of Our Lives spoilers. The Days of Our Lives spoilers for Friday, April 28th, predict that Jade makes an oops-ie in front of Tripp! Well, it’s probably hard to spend a lot of time together and keep up an act–and if you’re not an experienced soap schemer, it’s probably even harder. Friday, Jade (Gabrielle Haugh) makes a slip in front of her new roomie, Tripp (Lucas Adams). Will he figure out who she really is before she manipulates the heck out of him too? What do you think, dear Soap Cities readers? Meanwhile, Kayla (Mary Beth Evans) and Steve (Stephen Nichols) make progress in gaining Tripp’s trust and bonding with him. Things have been going well in this regard, overall, at least. Let’s hope for strengthened ties among these three as time goes on. Sonny (Freddie Smith) and Paul (Christopher Sean) are hot on Deimos’ (Vincent Irizarry) trail. They know he’s headed for Canada, and they set off behind him. Hopefully, they’ll get to him before he does something totally wacko to Brady (Eric Martsolf) and Nicole (Arianne Zucker). The happy couple in Canada’s joy comes to a screeching halt. Does that mean Deimos is going to do something, well, Deimos-ish to them? You’ll have to tune in to find out! Both Abigail (Marci Miller) and Gabi (Camila Banus) get some heavy weight off their chests. Abigail confronts Gabi about one of their shared interests, Chad (Billy Flynn) Gabi, for her part, encourages Abigail to work on her marriage to the young DiMera. Previous ArticleB&B Romance Report Card: How the Love is Measuring Up–Vote in Our Poll! Next Article The Bold and the Beautiful Spoilers, Friday, April 28th: Will Coco and Sally Go Down Together? !